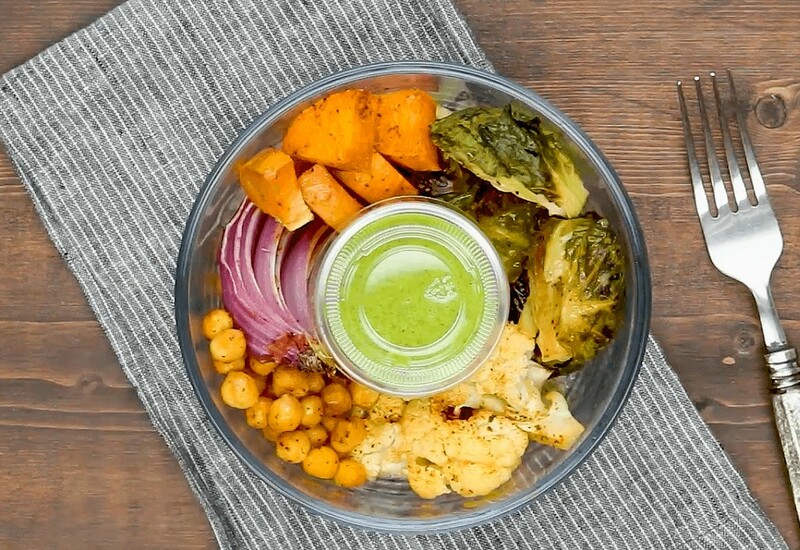 Use this kitchen hack to make four delicious and healthy lunches with roasted vegetables in under an hour. Green Goddess Sauce just sounds decadent and elegant, doesn't it? It is a brilliant blend of fresh parsley, fresh mint, and fresh dill, along with garlic, scallions, lemon juice, kosher salt, olive oil, feta cheese, and Greek yogurt. It is served over a beautiful array of sweet potatoes, Brussels sprouts, and cauliflower florets, as well as chickpeas and brown rice. Add additional feta cheese to your veggie bowls for a creamy, salty boost! This is the perfect hearty lunch for a chilly fall day! Per Serving: 642 calories; 29g fat; 83.7g carbohydrates; 16g protein; 4mg cholesterol; 1192mg sodium. soo delish. easy workday lunch. Goddess sauce is good on everything! I add chicken and I have lunch ready all week. Making this today but I have a silly question. Do you reheat to eat or enjoy this cold like a salad? Just finished my meal prep with this recipe! Amazing! I couldn't resist eating one bowl tonight, ha! Loved it, definitely in my top three faves! Really good recipe! Meal prep was exactly what I was looking for, tried it, and loved it. Instead of brown rice I used quinoa. I used a quinoa/rice mix that I really liked, might add chicken or marinated tofu next time! Green goddess was an absolute stomach bomb, I’d avoid it or sub out the Greek yogurt/lemon combo for some tahini if you have a sensitive system. Husband approved and full of flavor! I added rotisserie chicken to the meal and it was delicious. Definitely added to my rotation! Made it just as directed, my daughter and I loved it. Didn’t have the yogurt and had to use sour cream. Everything was great. Brown rice is best rice!